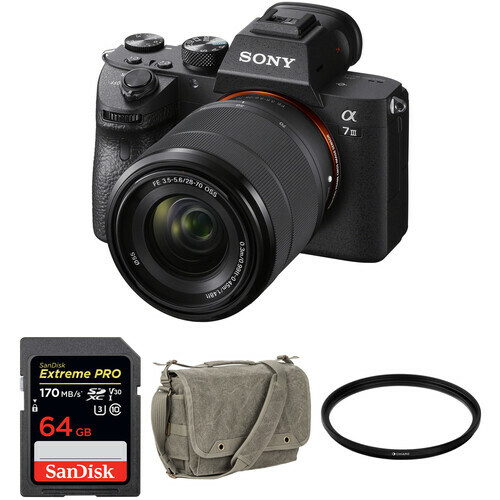 An ideal starter bundle, the Sony Alpha a7 III Mirrorless Digital Camera with 28-70mm Lens and Accessories Kit from B&H extends the camera's versatility with the addition of a memory card and a spare battery. The Watson NP-FZ100 Lithium-Ion Battery Pack replaces the Sony NP-FZ100 battery. Plus, the battery has a capacity of 2000mAh, an output power of 7.2V, and 16.4 watt hours. Box Dimensions (LxWxH) 9.5 x 6.0 x 5.5"
Box Dimensions (LxWxH) 4.9 x 3.2 x 1.2"
Alpha a7 III Mirrorless Digital Camera with 28-70mm Lens and Accessories Kit is rated 4.6 out of 5 by 405.
which languages are supported? There is italian language on sony body? Hi Filippo, yes you can select Italian as a language on the a7III. does it have original sony battery FZ 100 ? Yes it does and it's lovely. Lasts very long.